Beechwood Bowling Club was founded in 1904 and is one of the oldest clubs in South Wales. Situated in the beautiful Beechwood Park on the east side of the City of Newport. 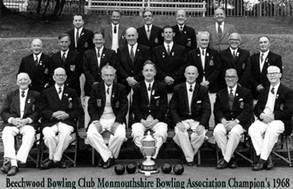 In the early years the club played an important part in the formation of the South Wales & Monmouthshire Bowling Association, and subsequently competed in that associations league and competitions. In 1909 the then Mayor of Newport Councillor Graham White, presented the association with a shield to be competed for annually. This was subsequently won by the Beechwood club in 1910, 1912, and 1915. The competition was not then held until 1919 when a new club St. Julian's won it for the first time. Beechwood again winning the competition in the years 1920,1921 and 1922. G. Edwards and C. Ramage who skipped the rink. At the Newport Bowling League A.G.M. that year Mr. E. W. King a Beechwood member was elected President for 1937, the Chairman of the Newport Bowling League Mr. F. Mole, who again was a Beechwood member, was subsequently elected President of The Monmouthshire Bowling Association for 1937. 1989 After many years of representation to the Newport Borough Council a new Pavilion was built and opened by Her Worship The Mayor of Newport Councillor Mrs. Veronica Brydon on the 5th. June that year. 1991. 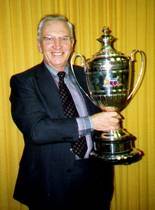 This year the club won the Newport Bowling League for the second time in four years. A notable achievement also this year was the winning by Mr. Ken Binns a Beechwood member, of The City of Bath Open Singles Competition. against The Welsh and the Monmouthshire Presidents Teams, the Barbarians Bowling Club as well as other representative matches. All together a memorable year. 2004. Centenary Year. For the past two years preparations have been ongoing to ensure that this year will be one to remember. It was decided early in discussion, that we would redesign the club badge & tie, this has now been achieved, the new badge appears for the first time on the first page of this Web Site in the top left corner with the last appearance of the old badge ,top right. Celebration matches have bee arranged with the Presidents of The Welsh Bowling Association, The Monmouth Association, The Barbarians Bowling Club and The Chairman of the Newport League, these together with a full fixture list for both club teams ensure that we will have a very busy season.